It's time for a Block Blog Hop! We're glad you're joining us! 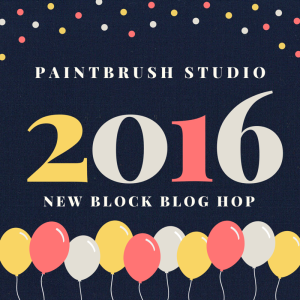 We're excited to be sponsoring a blog hop this week featuring our Painter's Palette Solids and blocks from more than 35 bloggers. Each blogger will be sharing a tutorial for a block they've created using a six-fabric bundle of solids. And of course, no blog hop is complete without giveaways--over the course of the hop, you'll have six chances to win a 1/2 yard bundle of the blog hop's color palette (the only hard part will be deciding which blocks to make!). 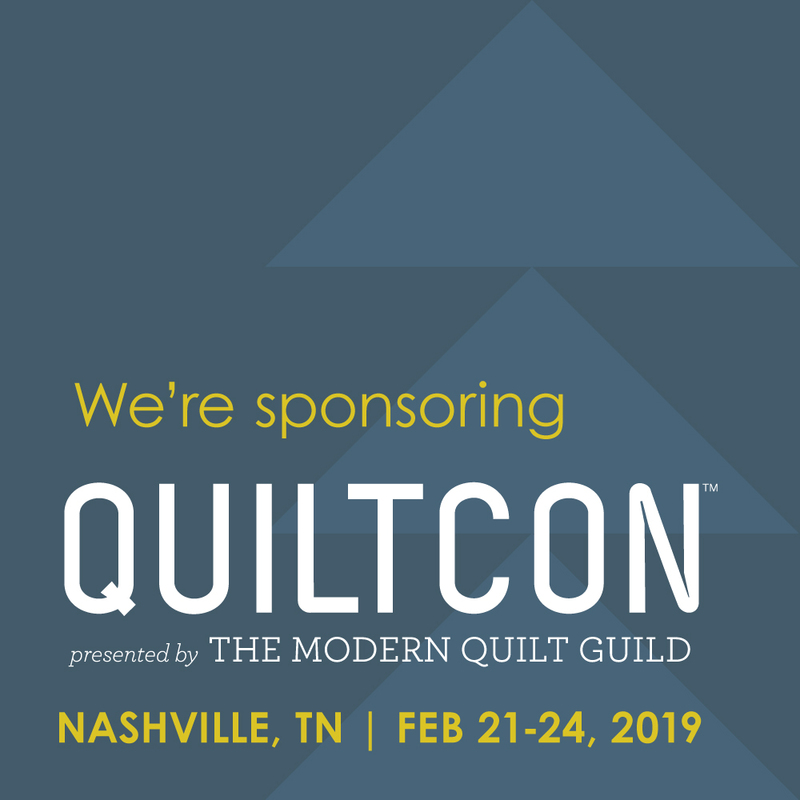 This block hop was organized by three lovely hostesses: Yvonne from Quilting Jetgirl, Cheryl from Meadow Mist Designs, and Stephanie from Late Night Quilter, who also selected this mouth-watering color palette. Thanks, ladies! 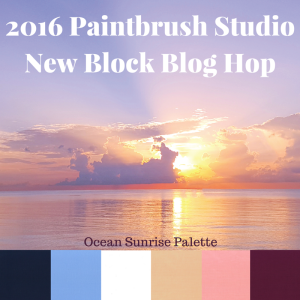 For a chance to win a 1/2 yard bundle of the Ocean Sunrise Palette of our Painter's Palette Solids, make sure you're signed up to follow Inspired by Fabric (either through a blog reader or via email; see options on the right-hand sidebar). Leave a comment letting us know that you follow and letting us know which of today's featured blocks you like best. For a second entry, follow us on Instagram (@pbstudiofabrics) and let us know in a second comment. This giveaway is open through Friday, April 1st (no joke!) at 11:59 pm EST. We will announce winners for all of the hop's giveaways next week. You'll have another chance to win a bundle today over at Yvonne's blog. I signed up today to follow you by email. I like Quilting Jetgirl's block. I follow the old fashioned way, on my dashboard. This is one blog hop I'm looking forward to! I'm already signed up for your emails. i follow on instagram and bloglovin. I like the Mountain View block by Love You Sew. I follow you on Bloglovin. I have to say I'm crushing on Terri Ann's Spiked Star block. Follow you on bloglovin. I love OBX Sunrise by 123 Quilt! I follow with GFC. I love the Spiked Star by Terri Ann. I follow on Bloglovin. I like Sunrise Stars. Various block construction skill levels. I follow you on Bloglovin and I like Silvia from A Stranger View's block! So far, it's the Skein Block (A Stranger View)!! I follow via Bloglovin! I like Sylvia at A stranger view's quilt block. Aw, thank you guys! I'm a bloglover's follower and I am in love with Yvonne's block. I follow you via e-mail. I like Sunrise Stars by Patch the Giraffe for today's block. Thank you for the giveaway. I also follow you via Instagram. Thanks! I'm partial to my own block but other than that I really like the block from Quilting Jetgirl. I follow you on Bloglovin. Thanks for the chance to win! I follow inspired by fabric by email. I looked at all the blocks. Sure some beauties in the bunch. The color palette is not one I've thought to work with so it should would be fun to have a chance! Think I'd have to pick Quilting Jet Girls block if I have to pick a fav. I'm already a follower via email and my favorite block today is the Spiked Star by Terri Ann. I follow you by email and these are a great color mix. Love the Skein block by Sylvia at A Stranger View. I do follow your blog, and though all the blocks are well done, the one from Sarah@123 Quilt is really cool. Thanks for sharing! I follow your blog via email. My favorite block is the star block by Patch the Giraffe. All of the blocks are great and will make awesome quilts. I signed up to follow by email! My favorite block is Oceanglow designed by Yvonne at Quilting Jetgirl. I like the way the solids individually grab your attention yet they work so beautifully soothing as a whole block. All of the blocks are fabulous though, it was a hard decision. I receive the emails! I love the oceanglow block! Love the Mountain View block. I get the newsletter. I follow via email. So far my favorite is jetgirls Ocean glow block. Sunrise Stars is my favorite. I follow via email. I follow you via my yahoo account. My favorite block today is a toss up between the Spanish Tiles block by Diana and the Spiked Star by Teri Ann. I like them both a lot! I follow via email. Love the Spanish Tiles block. I'm an email follower, I love the sunrise bonus block by Quilts of a feather. I follow you by email. My fav block is the "Spiked Star" by Teri Ann of Childlike Fascination. Spiked star at childlike fascination is my favorite! I'm tied in my mind between Renee's @ Quilts of a Feather and Yvonne's at Quilting Jetgirl! Do I have to pick? I follow on Bloglovin and I like Diana's Spanish Tiles ! mountain view! I follow you on bloglovin. I am following via blog lovin and I like Jess's block. All the blocks are really nice, but I think I like Sunrise Stars by Chelsea the best! I love Renee's block!! thank you! I'm folloing paintbrush studio on instagram. I follow by email. Those are some really great blocks. I wrote down 6 I must make. I guess I'd say Sarah's OBX Sunrise is my top choice. Talented women. Thanks. i follow inspired by fabric on blog lovin' and the block i like the most is sunrise stars by patch the giraffe. Thank you for the great blocks and tutorials!!... I've added them to my to-do list! I think my favorite today is Bernie's at Needle and Foot... I've been playing around with "woven-look" design ideas, and I like the looks of this block! I have to try this one first! I really like Yvonne's Ocean Glow. I follow by email. There are fabulous blocks and one of my best favorite is Skein Block by A Stranger view , love paperpiecing patterns. I do following by email.Thanks for the fun. I follow Inspired bt Fabric via email. I follow the blog via email! I really like Silvia's Skein Block. I saw lots of creative blocks today! My favorite is the Skein Block. I especially liked how many different looks you could get by varying the layout. I follow by GFC and email. Wow! So many beautiful blocks it's impossible to pick a favourite. I follow on bloglovin. I'm an email subscriber of INspired by Fabric. Found ya'll during the Dryad Blob Hop. My favorite block is the Skein BLock by Silvia w/A Stranger View. Love the variations she's presented for block arrangement, especially Tipsy bird. Thank you for sharing. I follow by email and liked Sunrise Stars the best. Everyone did a great job in the block designs, and the fabric is beautiful. I've been following on Bloglovin. My favorite is Terri Ann's Spiked Star. I like the block designed by Yvonne of Quiling Jet Girl. I follow you through blog lovin!I love Terri Ann's Spiked Star! I'm a follower of your blog via Bloglovin'. My favorite block today is Sunrise Stars by Chelsea at Patch the Giraffe. Thanks. I love all the blocks at Quilts of a Feather. It was so creative and delightful. Following you by email and love all the blocks - Spiked Star being a favourite. I love the midnight starfish block. This is such a fun blog hop! I learn a lot on constructing blocks from the participants and I love to see the variety in blocks. Thank you for a chance to win. I follow you via IG. I follow by email and I love them all! I follow by email and love the palette! I follow your blog (love!) 2 ways so I never miss a post: email and bloglovin. Cannot decide on my fave!! Sara at 123 Quilts I guess is my favourite, although I love Renee's at Quilts of a Feather and Bernie's at Needle and Foot is cool too. I follow on Bloglovin. All of the blocks are awesome, but my favorite is Spiked Star by Terri Ann of Childlike Fascination. Thanks! I follow via Bloglovin. I like Spiked Star the best! I follow via Instagram as well. I love Chelsea's Sunrise Stars. I follow you via email (wordygirl@earthlink.net). I am crazy abut Renee's block today. My favorite block for today is the Skein Block, great layout possibilities. I follow your blog on Bloglovin'. I'm an Instagram follower too. Quilting Jet girl's block is fun! I follow through blog lovin' as Debby6109. I love the spiked star block by Childlike Fascination. I follow you by e-mail. Mad for Solids: Announcing our Sweet Sixteen! March Madness: We're Mad for Solids! The BEST way to decorate Easter Eggs! More Watermelon Summer Charity Quilts! A little Row by Row inspiration!